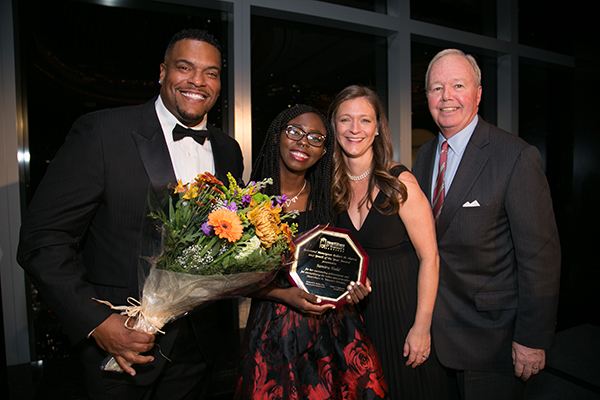 HeartShare St. Vincent’s Services honored Samira Todd as its Youth of the Year, an over 60 year old tradition at the agency’s annual fundraiser. The HSVS Annual Benefit at the Mandarin Oriental on Tuesday, November 7 hosted nearly 500 guests and raised over $400,000. The honorees created a dialogue around the widening resource gap for marginalized New Yorkers and how HeartShare St. Vincent’s provides tools to equalize opportunity. Samira Todd, an HSVS American Dream Scholar, has been labeled all her life: poor, black, homeless, a foster child. Raised by a struggling single mother, her family lost their home and was forced into a shelter. In her first foster home, Samira tragically was abused at the hands of her foster parents. No matter what, Samira refused to give up and never succumbed to the stereotypes that society used to define her. Today, Samira is a sophomore student at SUNY Oswego through the school’s Educational Opportunity Program. Samira hopes that her educational and personal experience will allow her to work as a psychologist who serves children and teens experiencing “rough patches” in their lives. (left to right) Sean Ringgold (Actor and HSVS Board Member), Samira Todd (2017 Youth of the Year), Dawn Saffayeh (HSVS Executive Director) and Ken Nolan (HSVS Chairman of the Board). Former ADP Scholar Mamadou Dione introduced Samira. Mamadou, who grew up in foster care, earned his B.A. from NYU Tandon and currently works as a civil engineer at Turner Construction. “If I could go around this room and hug each and every one of you, I would,” beamed Dione, who now sits on the HSVS Junior Board. During the evening, guests also heard from Alonzo Randall, who was planning on joining the Marines to finance his education. He learned about the American Dream Program, which saved him from the military frontline. Today, he is a freshman at Monroe College, and hopes to become a police detective who can empathize with and support communities of color. Following the premiere of the video story, guests showed their support on the spot by texting nearly $40,000 in mobile pledges. The event also honored union leader Kuba Brown, Business Manager and Financial Secretary for International Union of Operating Engineers, Local 94, 94a and 94b. Kuba spoke of his Brooklyn childhood and his difficult start in life, not much different than the youth in foster care who shared their stories earlier in the evening. 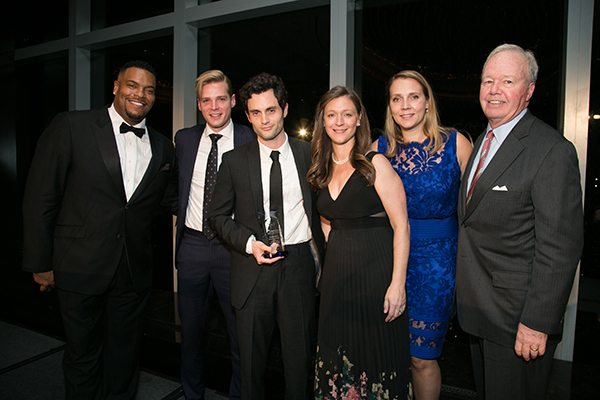 The HSVS Junior Board honored Musician and Actor Penn Badgley as their rising star for his weekly volunteerism at one of the agency’s after-school programs in downtown Brooklyn. (left to right) Sean Ringgold (Actor and HSVS Board Member), Robert Serenbetz (HSVS Junior Board Co-Chair), Penn Badgley (Actor and HSVS Rising Star Honoree), Dawn Saffayeh (HSVS Executive Director), Dahlia Mechanic (HSVS Junior Board Co-Chair) and Ken Nolan (HSVS Chairman of the Board). Celebrity ambassador Penn Badgley made a splash, as guests beamed over meeting the famed “Gossip Girl” star. The musician and actor was honored with a “Rising Star” Award for his volunteerism at one of HeartShare St. Vincent’s Services’ after-school programs in Boerum Hill. “Even if Penn is on set for 12 hours shooting his new film, he visits our program every Wednesday evening. That is the consistency that children and youth need from a supportive adult. We are grateful for his service,” said HSVS VP Brooke Rosenthal, who oversees the agency’s community development programs, including after-school and summer camp sites throughout Brooklyn. In observance of November’s National Adoption Month and upcoming holiday season, HSVS Executive Director Dawn Saffayeh shared how to help. “Whether you can make a donation, become a mentor or contribute to a toy drive – it’s all making a difference. What seems like a small act of kindness can make a world of a difference to someone else,” Saffayeh said.